Personal comments: The first 11 episodes (except episode 8) which actually started airing in April season are episodes from the original The Melancholy of Haruhi Suzumiya in chronological order. Starting from episode 12, is the new add-on to the original story, so far, is only one recurring story called "Endless August" (some place translate it to "Endless Eight"). To be honest, I haven't been very impressed by this "Endless August" so far. It feels like a badly made version of Higurashi no Naku Koroni without all the horror and thriller elements. I would call "Endless August" more an instrument of fan torture than a storyline similar to Higurashi. The way that the anime treats this arc is to have 5 episodes (and counting) containing the storyline of the same one episode. So every episode after episode 2 has the same exact story as episode 2. Its like they are trying to see how much they can get their fanbase to watch the same episode to see an ending that doesn't happen. 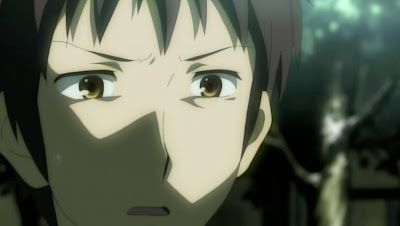 However, this ending never occurs because Kyon has a raging case of "She's not my girlfriend" which is the main reason that this has occured in story 15,000 times and in 5 episodes. I'm getting a bit tired of seeing this repeat. But it does make me wonder how the novel did this part of the story. For the most part, I heard the original series followed pretty close to the novel. I wonder whether this is the creation of the original author or just the expansion of the anime's producer. According to people on forum topics regarding this issue, the novels only repeated 3 times. Once to show the first story, the second time to show that it repeats and the third time for resolution. Essentially, the novels did it the way everyone expected the anime to do it. I also noticed that unlike the first series, the new series does not include a preview for the next episode. This is very unusual for anime to do, and especially for this series because you had to watch the preview to know wtf is going on. However, this is probably due to the fact that if people knew what the next episode was, they would never watch it. However, on same forum they later correct themselves by saying that there is in fact no repeat at all. I think the reason they didn't have the preview is the fact everything in this series are in chronological order. The only real use for the previews in the old series are to give you a clue which episode is which since Haruhi was announcing the episode number as what they should be in the actual chronology order. Actually, you only watched the previews in Haruhi to understand the episode order. Most anime that I have watched have had previews anyway. I also have to question the logic of showing the series in chronological order in the first place; I thought that the Japanese didn't do reruns. The affect of having to wait between rerun episodes for new episodes just irritates me. The entire series feels like trying to watch a filler-heavy series like Naruto. This amazes me, considering the size of the series. I Think it's annoying, all those reapeating episodes. The endless august is something that should not have been released or at least shortend to 3 episodes. What they could have done to make it interesting is putting little changes with clues in each episodes giving the fans to speculate, it dont have to be much, but a minimal is in order to keep it non-boring.